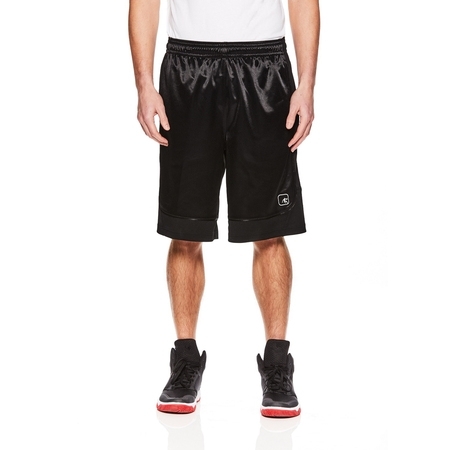 AND1 Men’s Core ALL COURTS Basketball shorts feature Dazzle fabric with high shine finish and matte textured twill side panels. Designed with fold-over elastic waist and adjustable drawstring. Shorts also have generous side panel pockets for storage, 12” inseam for range of motion and authentic performance basketball fit. Contrast brand logo’s on front and back. Many options to choose from; solid, for a clean look, color-blocked for a touch of style and all-over printed for those who want to show off their style both on and off the court. These AND1 shorts bring premium performance ready coverage, comfort and style to the court and any other activity you choose. Fabric Care Instructions: Wash with like colors,remove immediately,do not bleach. ;Machine wash cold. ;Cool iron as needed,do not iron decoration. ;Tumble dry low. My son is very thin with long legs. These fit him very well. The yellow color will wake you up! Purchased for my husband and he finds them really comfortable,. Very comfortable for lounge wear. Great fit, very comfortable for just lounging around the house. I ordered more and I highly recommend this item. I really like how these shorts look on my son. The material is nice and comfortable for the price. Next time I will pay more attention to sizing. They fit a little big on my son, but he will grow into them. Seems like the materials got thinner/cheaper. I had these shorts in black and different gray colors as well as red/black for a few years and the material on these recent ones for sale seems thinner and more "see-through", which makes them weaker and less durable as well as cheap compared to the older ones. Do not like it very much that my legs are visible through the shorts and the materials are cheaper and the "thicker" part that covers my knees are at different lenghts. Should have cost less if they're gonna go cheap with these, especially since they snag easily with just your nail swiping the material. I needed clothes badly and I'm disappointed because I Iiked these shorts, now I need more money to afford better clothes when these go bad soon, when I thought these were still good.